Stylus Solutions Pvt. Ltd., housing some of the best content writers in India, is an entrepreneurial venture started off by Delnaaz Edulji ten years back and since then there has been no looking back on this exciting journey. HelloPost walks you through this woman’s entrepreneurial flight so you can leave with a deep insight of the roots of the company or probably some inspiration to boost the endeavor of a promising entrepreneur in making. Stylus Solutions, has also made a headway as an established courseware design and graphic design company in India. HelloPost congratulates every powerful and brave woman entrepreneur on Women’s day this year admiring the way they treaded their path from nowhere to not just somewhere. 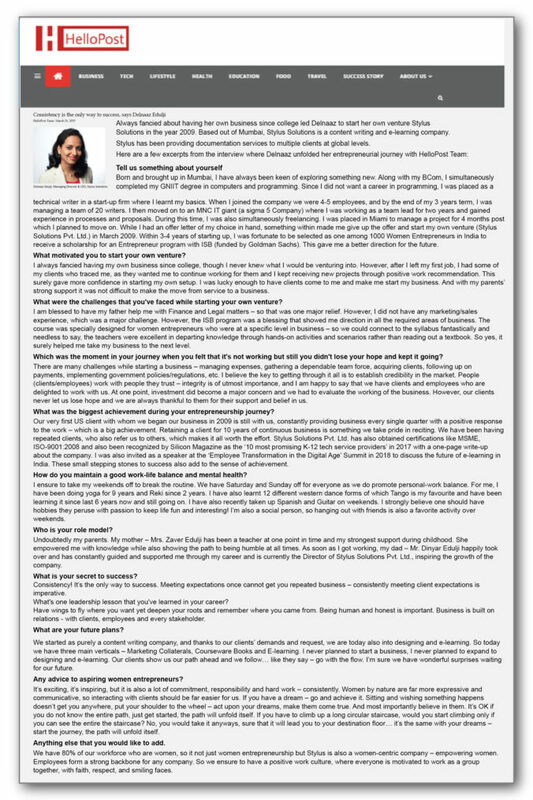 Delnaz Edulji, the CEO and MD of Stylus Solutions Pvt. Ltd., involved in e-learning content development in Mumbai, shares her experience on celebrating her achievement at global levels.